Samsung has announced its latest smartwatch, aimed at being the successor to the original Samsung Gear S. The device, called the Samsung Gear S2, comes in three variants, including the standard Gear S2, the Gear S2 Classic, and the Gear S2 3G. Many users today don't yet feel the need for a connected smartwatch like the Gear S2 3G, especially for the price. The Gear S2 and S2 Classic, however, could gain a serious user-base. But just how do they stack up against other devices on the market, like the also-new Huawei Watch? We decided to find out. Design is a very important element when it comes to smartwatches. Because of the fact that they are worn, they become a fashion accessory, even more so than a smartphone. As far as design goes, however, you really couldn't go wrong with any of these devices. The Gear S2 is arguably the first Samsung wearable that actually looks like a watch. It features a round face, which seems to have come out as the general preference for users, as well as a sleek, metallic look. The main body comes in two colors, including black or silver, with the band being available in a variety of colors and designs. Around the display can be found a rotating bezel, and on the left hand side can be found a home button and a back button. The device is 11.4mm (0.45 inches), and the body is 42.3 x 49.8mm (1.67 x 1.96 inches). The Gear S2 Classic is the same shape as the Gear S2, but features a more "timeless" design. The strap can be removed and replaced with a standard 20mm strap, however the one that it comes with is a premium-looking leather strap. It is also a little smaller than its sportier cousin, featuring the same thickness with a 39.9 x 43.6mm (1.57 x 1.71 inches) body. The Huawei Watch is arguably the most "classic" looking of the three devices. 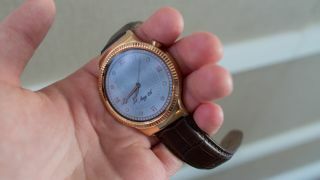 It comes in a selection of brushed-metal, gold, or black, with a crown, which is really just a button, at 2 o'clock. The device comes with a selection of either a metal strap to match the body, or a black or brown leather strap. The thickness of the watch is a slightly thinner 11.3mm (0.44 inches), and the diameter of the watch is 42mm (1.69 inches). Both the Samsung Gear S2 and Gear S2 Classic feature a 1.2-inch display with a resolution of 360 x 360 pixels, equating to 424ppi, or pixels per inch. This is certainly not bad, especially for a device this small. The Huawei Watch, however, features a larger 1.4-inch display, with a pixel resolution of 400 x 400 pixels, equating to 404ppi. The Gear S2 and Gear S2 Classic have a shaper display, however some might prefer the larger display that the Huawei Watch offers. Not only that, but the Huawei Watch also makes use of a Sapphire crystal lens, which should ideally make it a little stronger. Basically, the Samsung devices offer a sharper display, while the Huawei offers a larger and stronger one. The Gear S2, Gear S2 Classic and the Huawei Watch are pretty similar when it comes to connectivity. They all offer Bluetooth 4.1 as well as Wi-Fi, both features that are pretty standard on smartwatches these days. Where they differ, however, is in the fact that on both of the Samsung devices NFC is also available. This is actually a pretty big deal, especially considering the fact that mobile payment systems are gaining steam in terms of popularity. Samsung is set to release its own payment platform, Samsung Pay, to the public in the very near future, and it is likely that NFC on the Gear S2 and S2 Classic will play an important role in that. Battery life is an important thing to take into consideration, especially because of the fact that wearables seem to have had a hard time with battery life to date. On paper, it seems as though the Huawei Watch offers the better battery life, offering a 300mAh battery compared to the Gear S2's 250mAh battery. It's important to remember, however, that the Huawei Watch has a larger screen, likely needing more battery to power it, and thus probably ending up with a similar battery life as the Gear S2. It's also important to note that the Gear S2 and S2 Classic offer wireless charging, while the Huawei Watch does not.